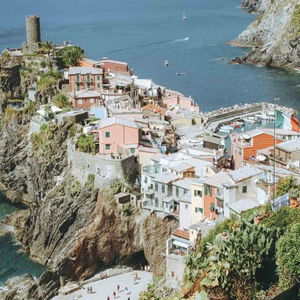 The Steele Maiden - Fashion, Travel & Lifestyle. Based in NYC. But then this past week hit and it was like all of my favorite stores conspired to put their cute new spring clothes on sale and tempt me. I nearly hit ‘buy’ at no less than 3 different stores this past weekend alone. But each time, something stopped me. And that’s my “wishlist”. About a month ago, knowing I would inevitably want/need a few new things for the season ahead I made a list of things that made the cut. A new spring blazer (the ones I had for work in Fall and Winter got a ton of wear so it makes sense to get a lighter weight one for this season), a belted shirtdress (the one shown in these photos was something I got last summer and wore countless times – a new color will be good to add into the rotation). And so on. So this past weekend, every time a sale nearly tempted me (hello cute gingham swimsuit that’s only $27!) I referred to the list. Is it on there? If not, then pass. For god sakes I already own a gingham bikini! But it’s so easy to get swept up in 50% off and something shiny and new. I’m not saying I’ll never impulse buy again, but after years – nay, decades – of that habit, I’m more than willing to at least finish out this year with a more stringent approach. That being said, a new spring bag was on my list and this one (which is, ahem, on sale right now) hits all the marks. Feels fun thanks to the gingham print but the neutral colors means it will match with nearly everything in my wardrobe. What’s on your “wishlist” this spring. See more of mine here. This time of year always makes me want to switch up my home decor. 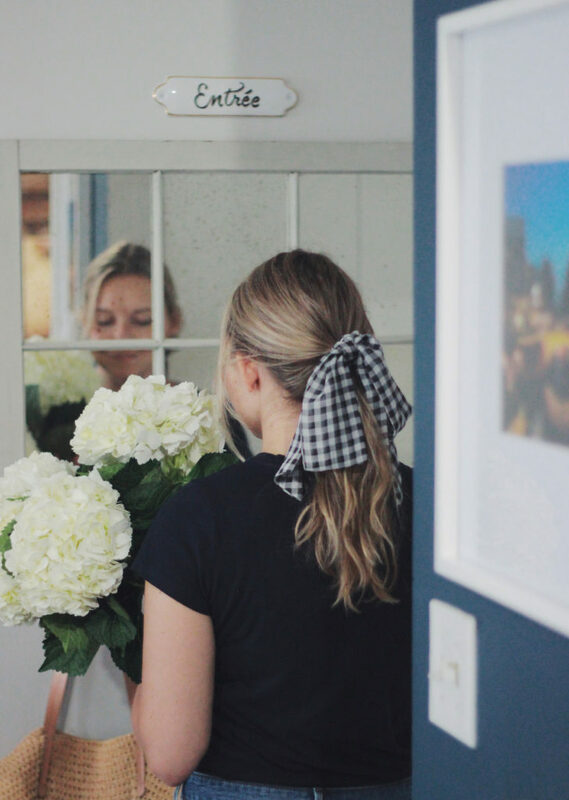 Luckily, we’ve still got plenty of projects to work on here – but if you’re in the mood for something that freshens up your space, below are my favorite weekend projects that are big on impact but still simple, affordable and rental friendly! Hands down my favorite way to make a big statement in a room without a huge commitment. 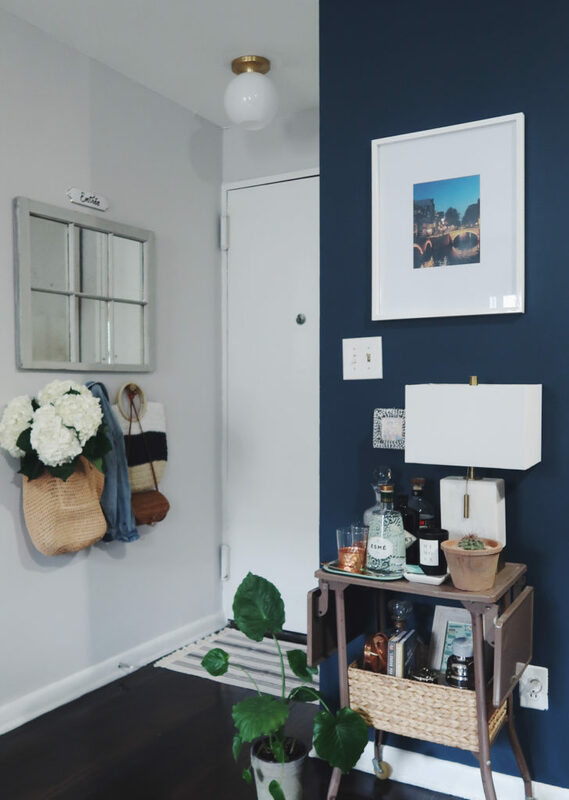 My go-to has always been a rich, dark color – in my first NYC studio apartment I carved out a “bedroom” nook with a deep charcoal grey color behind my bed and it felt so cozy, but in this apartment I love our navy wall that leads into the entryway). 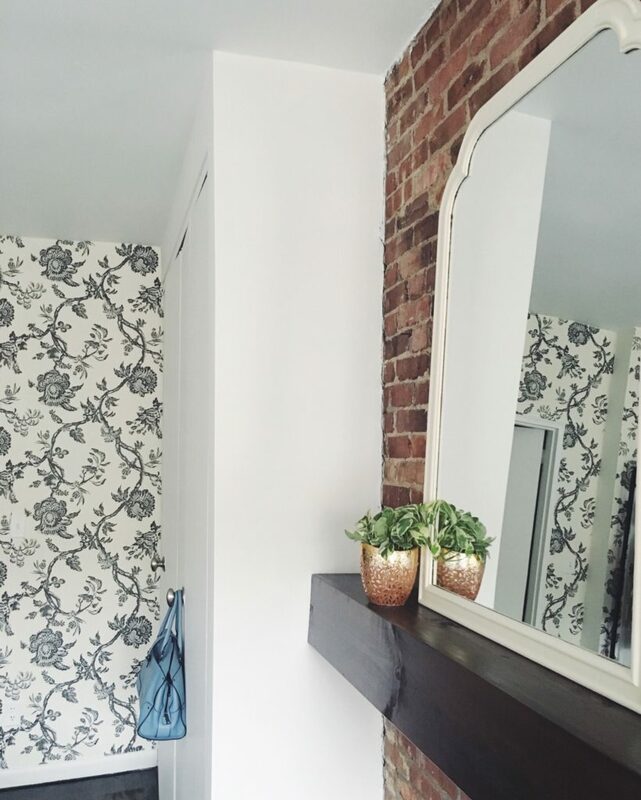 And if your landlord approves it – I can’t recommend wallpaper enough. More expensive than a can of paint but SO much fun and personality can be added via print on a wall. 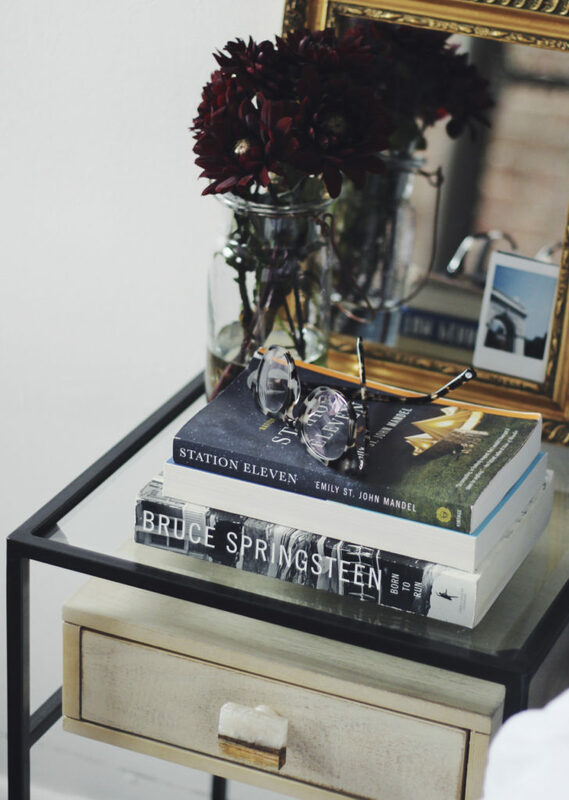 I found the below nightstands at Home Goods – and while I loved that they were simple, narrow and included a drawer, the original black knobs made them look cheaper somehow. I found these agate and wood rectangle knobs at Anthropologie, swapped them out in 5 minutes and it elevated the whole look. Plus no one else will have the exact same nightstands now! An under $20 upgrade that makes me happy every time I see them. The only thing I truly disliked about our current apartment was the stock, rental light fixtures. If you’re a renter you know the kind. Those sort of gross flush mount ones that barely put off any light? Yeah.. get rid of those. I store mine high up in a closet so that when we move I can throw them back on and take my new lighting with me wherever we go next. While you’re at it? Add a ceiling medallion. I found this one for around $20 at Home Depot and it adds an instant bit of old world elegance to the place. Another 5 minute project that makes your place look really finished. To be honest, it’s really taken me a solid year in this new apartment to feel like I’m developing a green thumb. It takes daily maintenance. But the rewards of walking in to your home and seeing LIFE all around you is huge to me. 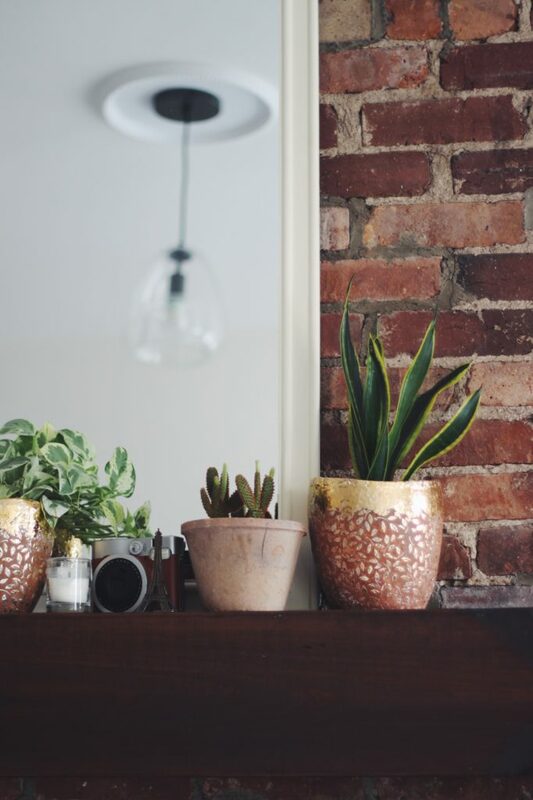 Plants are proven to help filter the air in your home and definitively make people feel happier. Grab a new green friend this weekend, put it in a pretty pot and voila! I wanted the look of a custom headboard but didn’t want to commit to the price. So we found a cheap upholstered headboard online, covered it in batting from the craft fair and then wrapped it in a beautiful rich velvet fabric I had (and secured with a staple gun on the back). The entire project cost $100 but looks so much more expensive then that. 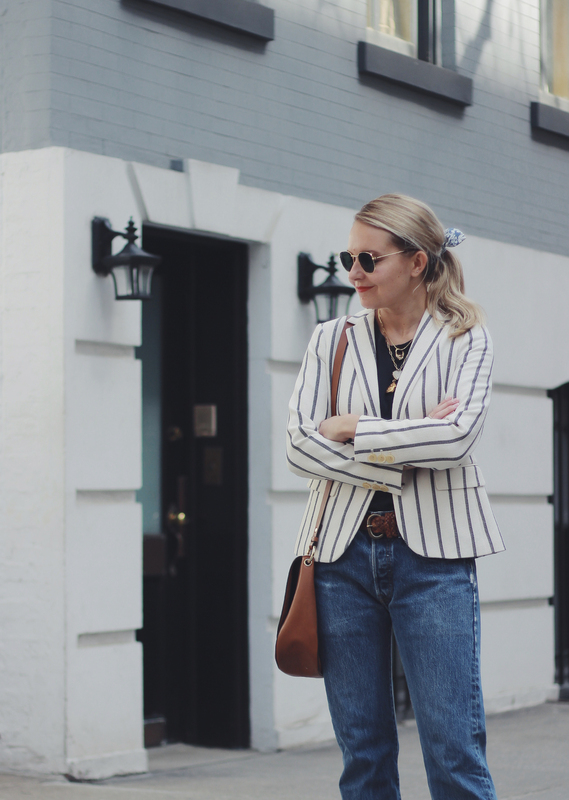 If I scroll back a few years into the blog archive there are quite a few outfits that don’t feel like “me” – not to say that I’m embarrassed of anything I wore, it’s just that it would likely have been better suited to someone else. A floral kimono comes to mind. The funny thing about defining your personal style is that it can take years to figure out.. but at the same time you kind of knew the answers all along. Think of the icons you loved when you were a kid. Mine were Jackie Kennedy, early Elvis and Dolly Parton and the cast of shows like The Wonder Years and Happy Days. I’ve always known that I loved tried and true American staples. 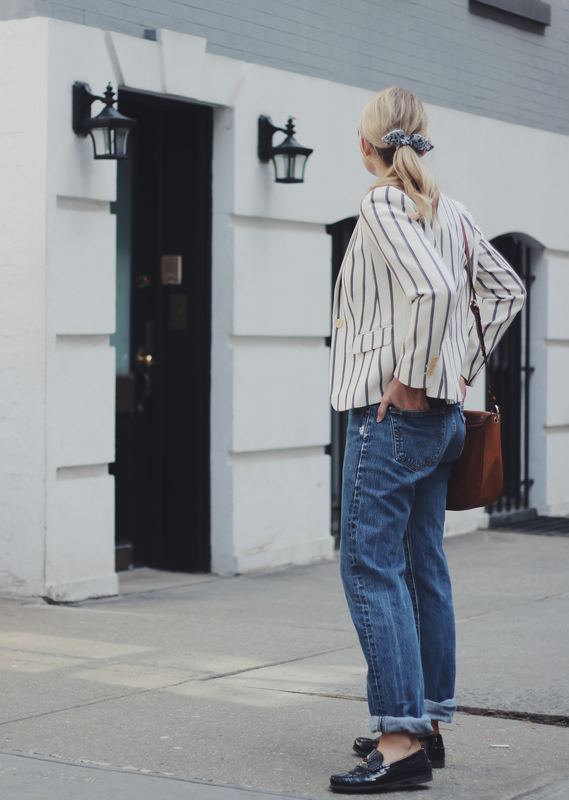 A 50s-era full skirted dress, New England fisherman sweaters, borrowed from the boys vintage Levi’s and 70s-style stripes. It’s what I feel most myself in. So why did I try to fight it with those palazzo pants or that body-con dress? Maybe, like finding a partner, you just have to try things on for size. Even if you know they won’t be right for you in the end. Years ago I wore a huge velvet bow headband to my Mom’s 50th birthday party. It was a whole look. But it felt like me. 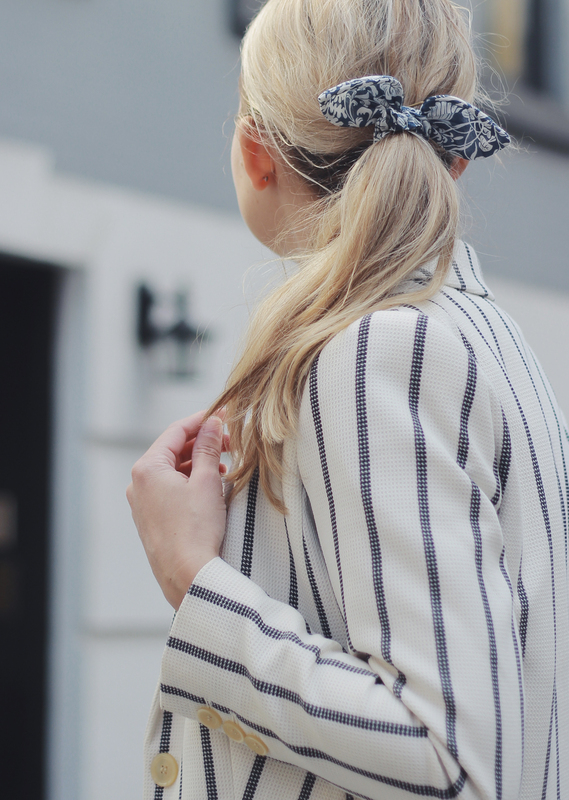 A little bit vintage schoolgirl prep, a little bit modern without trying too hard. My sister’s boyfriend at the time asked me if I thought I’d look back on pictures of the party down the line and regret such a bold fashion choice. I figured I’d see myself in those pictures and feel pleased that I was confident enough to wear exactly what I wanted at that moment. And p.s. 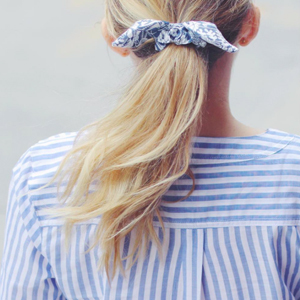 exactly that style of headband happens to be having a major moment right now. But I’m willing to let bygones be bygones. The point of the story is that if it feels quintessentially “you” at that moment, then wear it. Even if what feels like “you” shifts over time. Although spoiler.. I still love a good hair accessory. I’ve been thinking a lot this year about my wardrobe and the fact that I’m a happier with fewer things, but ones that all feel quintessentially Jess. The funny thing is that back in my shopping heyday I would have found this idea sort of stifling, but in fact it’s been so refreshing. Every morning I get such a happiness boost when I look into my closet and realize I truly love everything in there. And when I go to add new pieces, I simply ask myself if I’d feel like “me” when wearing it. 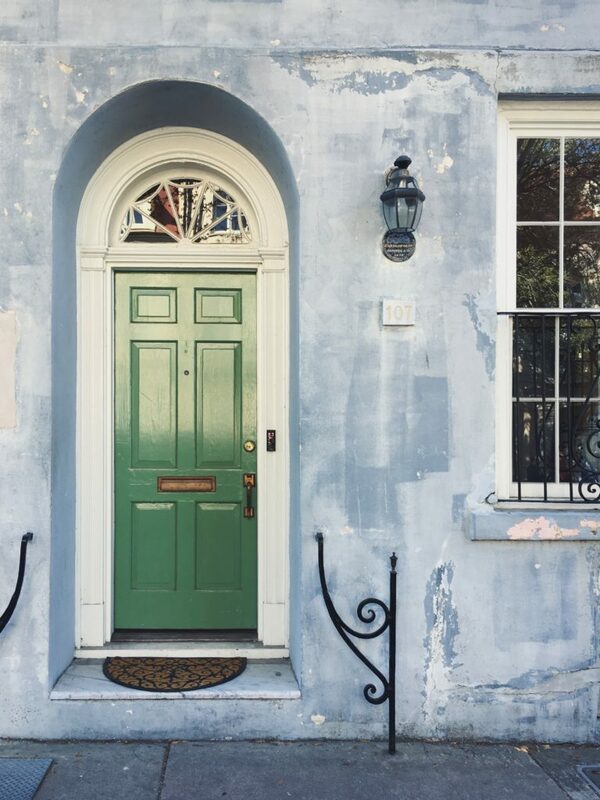 I spent last weekend in Charleston with my Mom and Sister on a little girl’s trip. It was my third time visiting that pretty city and I’m still charmed every time. 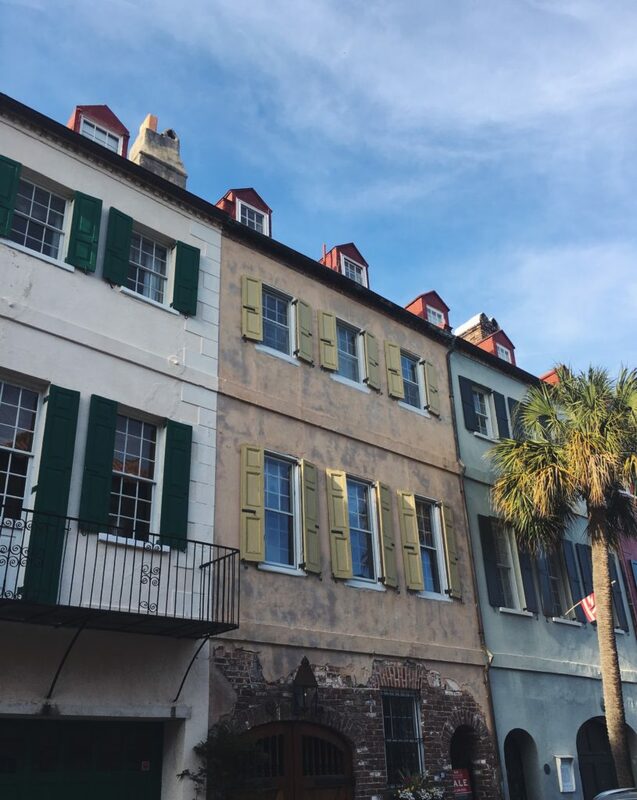 We repeated a lot of the favorites that I mentioned in my Charleston Travel Guide – but this time added on Hominy Grill for brunch, Fleet Landing for a sunset dinner with a view of the water and a candle-making class at Candlefish. Highly recommend all three! After adding a wallpaper accent wall, fresh coat of paint and new DIY mantle to our bedroom, things are really coming together. The next step is art on the walls, curtains and a vintage dresser makeover. Planning a post soon on all of my sources for affordable art, but this print just arrived and I’m in love. I’ve got my eye on this one next. 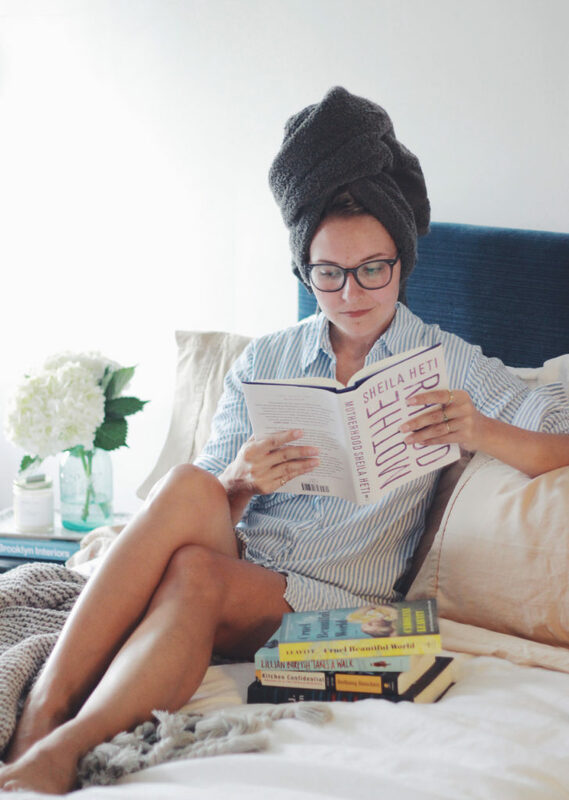 I thought this really honest post regarding money from one of my favorite British bloggers – The Frugality – was so refreshing. I find money to be such an interesting topic and most women really don’t talk about it. I’m thinking of starting a series here where I discuss financial things (like how I budget in an expensive city, how Adam and I handle money in our relationship, how I plan for longterm finances, etc.). Would that be of interest? Speaking of money (well, spending it I guess…) – after plotting and planning for over a year, we just booked on a short trip to Paris in May. I’ve been just once before and that was over 10 years ago but Adam has never been. And honestly, what could be more romantic then a quick skip over to Paris in the spring? I’m hoping to add a couple more pieces to my wardrobe before the trip and this breezy blouse under $40 feels just right. Send me recs if you have them! 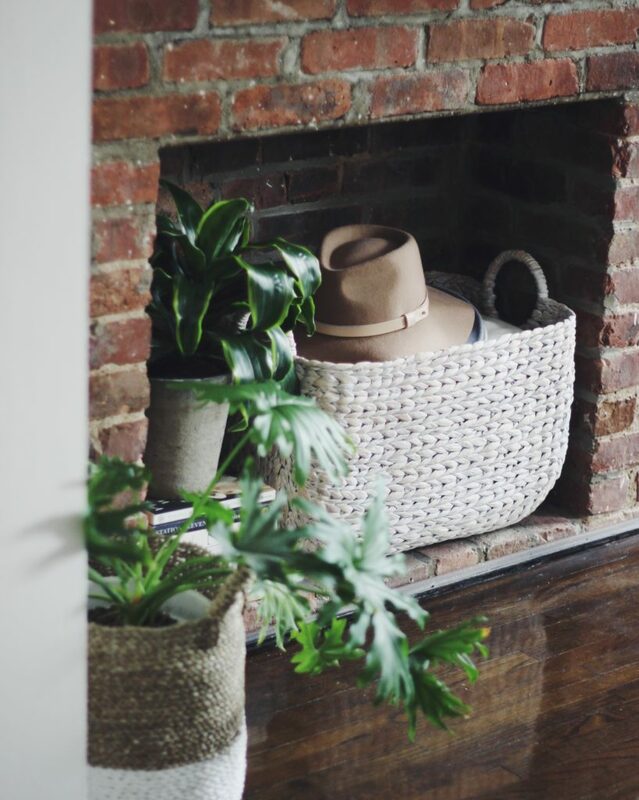 I’m starting to slowlyyy feel like the heaviness that I carry throughout winter (in my mood and general mental well-being) is lifting as we enjoy the first warmer days here in New York. March is always the toughest month for me mentally so now that I’ve survived it, I’ve got a few things planned this week to celebrate; like piercing the 2nd pair of holes in my ears (which I’ve wanted to do for like 5 years now, ha) and treating Adam to a fun brunch at our favorite Indian restaurant Babu Ji. Last week Adam and I got together with two other couple friends for a game night. We played Pandemic and it was SO fun. Everyone is essentially on the same team and you all get to talk about strategy, but it gets really exciting as you go. Highly recommend. I want to get a copy of it to keep at the lake house this summer. 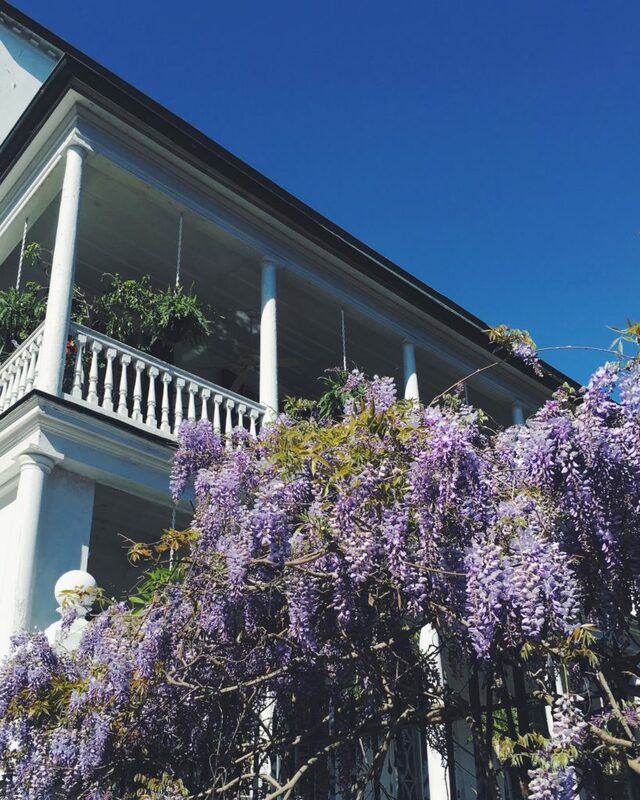 Since I shared my Spring Wishlist (along with a disclaimer that I’m shopping quite a bit less these days) I figured I’d also share my Spring Bucket List – aka all the places and experiences – I’m looking forward to this season. And what better day to share than the first day of Spring! A stroll along South Street Seaport. I love this area but it can get SO crowded in the Summer. The first really nice spring day is great for walking along the water, grabbing tacos at El Luchador and eating on the benches with a view of the Brooklyn Bridge. Snagging tickets to see the NYC ballet’s rendition of Jane Eyre. I’m always looking for an excuse to go to the ballet (and Adam has zero interest), so when a friend asked me to join her for this Bronte classic I jumped at the chance! Tickets go on sale this weekend. A glass of rosé on the Met rooftop – this has become on of my favorite spring traditions. Even better when you can see all of the fresh blooms in Central Park from above. Running a 10k! This was on my list of things to do in 2019 (for now, my half marathon days are on hold while I see how my knees hold up to shorter distances) and Spring would be the perfect time weather-wise to do it. We may end up staying in the city over Easter weekend and if so – I definitely want to try a new brunch spot. Although Friend of A Farmer and Buvette (two favorites) are still contenders.